People have been adorning themselves with jewelry (often spelled jewelery or jewellery in the United Kingdom) for a very long time. Numerous ancient people from all areas of the world are known for their beautiful necklaces, pendants, earrings, bracelets, and other forms of jewelry. The materials used, by these old civilizations, to make jewelry ranged from simple beads to such precious metals as gold and silver. The word "jewelry" (also spelled jewelry or jewellery) comes originally from the Latin word "jocale" which translates to "plaything". Ancient jewelry was indeed often used as a sort of plaything, for personal adornment, however it also had more serious uses and meanings. For example, in many cultures wedding rings have for many centuries been used to indicate the wearers marital status. Through out history jewelry has had both functional and symbolic purposes. These uses of jewelry are listed below. As it does today jewelry was used by early civilizations to symbolize wealth and power. In ancient Rome, only citizens of a certain rank were permitted to wear rings. Another example of this are the Crown Jewels of the United Kingdom which denote the wealth of the royal family and have been worn for centuries during coronations and other state functions. Through out history people have worn jewelry that expresses their religious beliefs. The ancient Egyptians wore jewelry depicting the Scarab bettle which was believed to hold strong religious properties and symbolized rebirth. 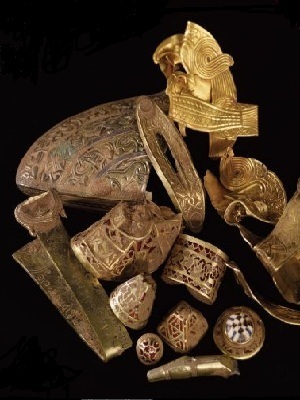 Archeologists have discovered many artifacts marked with the Christian cross, including necklaces and rings, from numerous civilizations, dating back to the 5th and 6th centuries. Numerous jewelry pieces containing the ancient Nordic Rune symbols have been found throughout Europe. These symbols had strong religious significance to the Vikings and other ancient Nordic people. Since the seventeenth century Hexagrams Including the Star of David) have been used on jewelry to symbolize the Jewish faith. In Africa many tribes wore elephant hair bracelets believing elephants served as a link between heaven and earth. Jewelry pieces such as brooches were originally made to connect pieces of clothing together. Through out history many cultures have utilized jewelry as a form of currency. In the sixteenth and seventeenth centuries Africa trade beads were exchanged for slaves and therefore were referred to as slave beads. In the 1600's and 1700's pirates, and others, would wear long gold linked necklaces and remove links in order to pay for goods and services. The oldest jewelry ever discovered was found in eastern Morocco and is approximately 82,000 years old. Several small shells covered with red clay, indicating they were meant for ornamentation, were unearthed by a team of archaeologists. In a cave named Blombos on the coast of South Africa simple bead necklaces made with small snail shells were discovered that are approximately 75,000 years old. Another ancient discovery of jewelry was made in Kenya where beads, made from ostrich egg shells, were unearthed. This jewelry is about 40,000 years old.